One of the reasons I often hear as to why people start full-time RV living is “I want to get away from the snow in the winter” and that’s one of my reasons too. But some enjoy the snow and is fine with RVing in the cold, but it does take extra work to do it. Water freezes at 32 degrees Fahrenheit, that’s nothing new. So what do you do with your water hose when you’re camping in temperatures below freezing? It won’t take long until the water in the hose has frozen solid and when that turns into frozen RV plumbing, you have an even bigger problem. Fortunately, there are heated drinking water hoses to prevent water from freezing. You just plug it into a 120v outlet, and the water will be monitored by the hose to make sure it won’t reach freezing temperatures. Today we’ll take a look at the best heated water hoses for RVs and campers. There are also ways to stop a water hose from freezing and hurting your plumbing without buying a heated water hose, and we’ll go through some DIY (Do It Yourself) methods to do this. For now, let’s take a look at the heated water hoses we’ll be comparing. We’ll start out with a brand that most of you will recognize, Camco. They make tons of RV accessories and tools so of course they also make a heated water hose. Camco has put a self-regulating heating cable on this hose that will heat more or less depending on how cold the hose is. The cable will make sure that your water doesn’t freeze all the way down to -40˚F (-40˚C) temperatures. So is it safe to drink the water going through this hose? Yes, it’s lead, BPA and phthalate free. It’s made with NSF 61 certified materials. Thick heavy duty fittings will make it the hose easy to handle even while wearing gloves and an included female-to-male adapter will let you connect either end of the hose to the water supply. This is nice of Camco to include since sometimes you might want to plug the cord into the RV and sometimes the power box might be right next to the water supply. The power cord is 10 feet long. 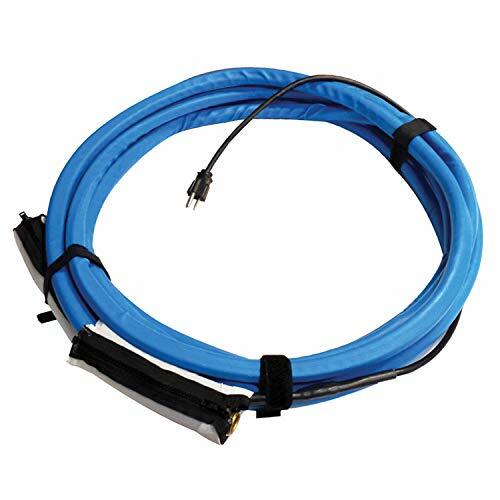 If this isn’t enough and you need to use an extension cable, make sure you get one rated for outdoor use, like the GE 25 ft Extension Cord for example. Next up, the Pirit PWL-03-25. Another “smart” heated hose with a thermometer that will only heat up the hose when it’s needed and not constantly. As soon as it’s 45 degrees Fahrenheit, the hose will start getting heated, and when temps reach 50 degrees Fahrenheit, it will stop. This way you won’t be wasting energy and heat up water that is nowhere near freezing. It can handle slightly lower temperatures than the Camco model, as the hose can reach -42˚F (-41˚C) without freezing the water. The hose itself is made with FDA approved materials, and advertised as safe for potable water. If the short 3 feet power cord is not enough for you and you want to use an extension cord, make sure you’re getting one made for outdoors. Like the GE 25 ft Extension Cord for example. The fittings on the Pirit are heavy duty and easy to handle even with gloves on. Last up is the Valterra W01-5325. Valterra is another company that makes a lot of RV accessories and I have talked good about their products before. They make this heated water hose that comes in three lengths, 15, 25 and 50 feet. The Valterra hose doesn’t have a thermometer on it. How it works is that it uses a self-regulating heating source that will apply more or less heat depending on how cold the hose is. The inside diameter of this hose is 1/2 in which is slightly smaller than the other two which have 5/8 in. Unfortunately, the power cord on this is pretty short at 4 feet so you’ll most likely need to use an extension cable. If you do, make sure it’s safe for outdoors. Like the GE 25 ft Extension Cord for example. The fittings are somewhat heavy duty, with an interesting zippered cuff on the edge for extra protection. I have not been able to find any information about what temperatures this hose can handle. 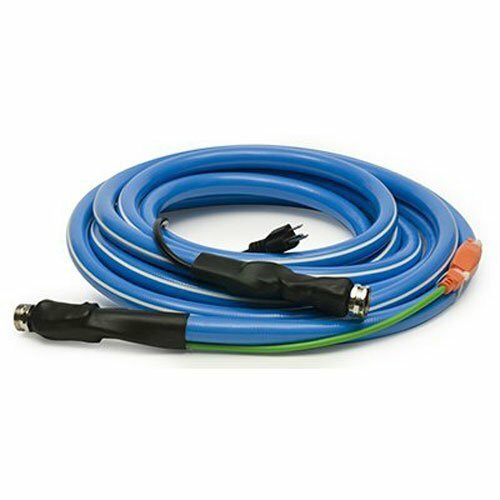 There are not a ton of choices when looking at heated water hoses for your camper and while there are some, I still recommend following a DIY method that you can find down below. But like I said in the intro, some RV parks and campgrounds don’t allow DIY hoses and while it’s a bummer it’s understandable since it can look like a fire hazard depending on the setup. Anyway, here are my recommendations when it comes to a heated water hose. 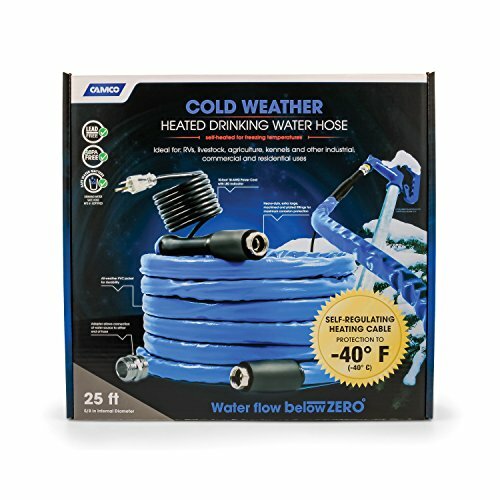 My pick: Camco Cold Weather Heated Drinking Water Hose – The Camco cold weather heated hose is a great choice that comes with everything you need to ensure that your water hose won’t freeze. The self-regulating heating cable will heat the hose when needed and with the included adapter the hose can go both ways to make sure the 10 feet power cord can reach an outlet. What I recommend doing to stop your fresh water hose from freezing is wrapping it with a heating cable. Most of us have hoses that we use in the summer that we like and want to keep using instead of splurging for a completely new hose with some heating cables. Heating Cable – You can find heating cables in a lot of home improvement retail stores, but the one I am using right now is the HEATIT JHSF 40-feet. My water hose is 25 feet and using a 40 feet heating cable is more than enough. I bought one 15 feet longer than my water hose so I could wrap it completely around both the water source and the end of the hose going into the trailer. When I don’t use the full 25 feet (I usually have several feet left) at the campground, I put the rest off the hose in a plastic bag with the heating cable. That could be hard with some hoses, the one I have is the Teknor Apex Zero-G. If you’re not sure how long of a cable you need, there’s a great chart on the product page that will tell you depending on how thick your hose is and how low temperatures you’ll be camping in. The HEATIT heating cable has an included thermostat that will start and stop heating when needed. You can zip-tie, tape with 3M Glass Electrical Tape or wrap it around your water hose. You could also use an insulation pipe below like I do to stuff both the hose and heating cable in. Insulation Pipe – I use Foam Pipe Insulation like this from Home Depot. The easiest thing, in my opinion, is to get an insulation pipe like this to put the hose and heating cable in. Not only does it insulate, but it makes sure that the heating cable is right on the hose and heats it accordingly. The foam pipe insulation I use has an inside diameter of 1 inch and comes in 6 feet. VIVOSUN Bubble Film Pipe Insulation – You can take it an additional step if you’re in really low temperatures or would rather use this instead of insulation pipe. Wrapping this around a hose will help prevent it from freezing and you could even wrap this around the insulation pipe, or put it inside with the hose and heating cable. Note that you might need a slightly thicker insulation pipe to fit it all. Do I need a heated water hose? If you’re going to be leaving the water hose out in temperatures below freezing (32˚F, 0˚C) then yes, you should definitely have a heated water hose. If you only go fill up the fresh tank you’ll want to make sure you have an insulated fresh water tank or enclosed tank bay at least to prevent your fresh tank from freezing. There are heating pads that you can install on your holding tanks for this purpose as well. How do I prevent my RV plumbing and holding tanks from freezing? You have to remember one thing when it comes to RV plumbing. Just because it’s warm inside your RV doesn’t mean it’s warm where the pipes are. If the water in your plumbing freezes, it will expand and crack the pipes. So the best way to keep your hoses and pipes safe is to not leave your city water hose connected to the RV when it’s the coldest, usually at night. If you have a compartment on the side of the RV where you fill up your fresh water, you should definitely put a heat lamp in there. You could even use an aquarium bulb to heat up the small compartment. Just make sure it’s not too hot after leaving it there for a while. I have seen insulation and other pipes melt due to heat lamps getting too hot. There are also RV skirts that you can put around the RV to keep the temperatures underneath your camper higher. A skirt together with a heat lamp can prevent holding tanks from freezing. Of course, the lower the temperature, the harder it will be to keep above freezing temperatures. Wrapping any exposed pipes in heat tape is also a good idea. I hope you’ve learned a thing or two about protecting your hoses and RV, let me know down below if you have any questions or tips on how to handle cold temperatures when camping.